Your round-trip train ticket will be sent to your Madrid hotel in advance of your tour. Simply make your own way to Madrid’s Chamartín Station, hop aboard your high-speed train, and then meet your guide in Segovia. The UNESCO-listed Roman city enjoys an idyllic setting between the rivers Eresma and Clamores, bordered by the imposing Sierra de Guadarrama mountain range. Gaze out of the window on the train and ogle the stunning sights as they slip into view. On arrival, travel with your guide by taxi into central Segovia, and then head out on your walking tour. First, take time to marvel at the city’s enormous aqueduct, one of the finest Roman monuments still to be standing on the Iberian Peninsula. The Aqueduct of Segovia’s precise construction date remains a mystery, though it’s thought to date back as far as the 1st century. The structure still carries water from the Fuente Fría River into the city to this day! Admire the sheer scale of this masterpiece of Roman engineering, and take time to photograph this important landmark. Continue onward with your guide to admire impressive Alcázar Castle, one of the most remarkable castle-palaces in the country. Built in the 11th century, this medieval fortress is often said to be an inspiration for Disney’s fairytale castle! As you explore the exterior of the site, imagine the many medieval tournaments, feasts and festivals that may once have taken place inside its walls. 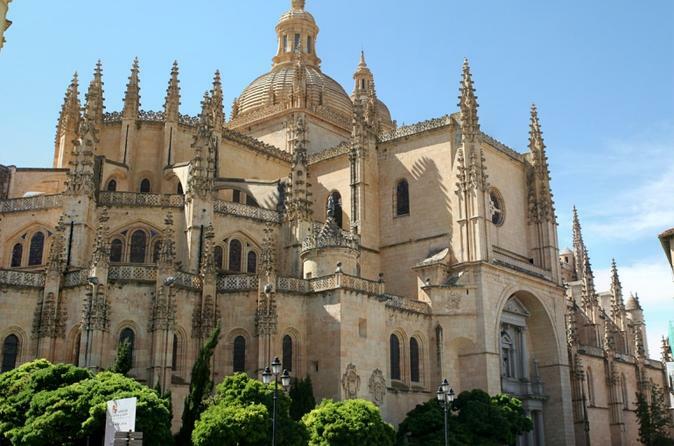 Your next stop is impressive Segovia Cathedral, fondly known as the ‘lady of cathedrals’ for its elegance. Built in late-Gothic style, this Roman Catholic church sits in the center of the city and boasts a fascinating history. Pose for photos in front of its attention-grabbing façade, and hear snippets of its past from your guide. After your walking tour finishes, enjoy some free time to see the city at your own pace. Perhaps ask your guide for tips for the best places to stop for lunch, and try out local delicacies such as suckling pig or delicious Castilian soup. Any meals, refreshments and admission tickets are at your own expense.